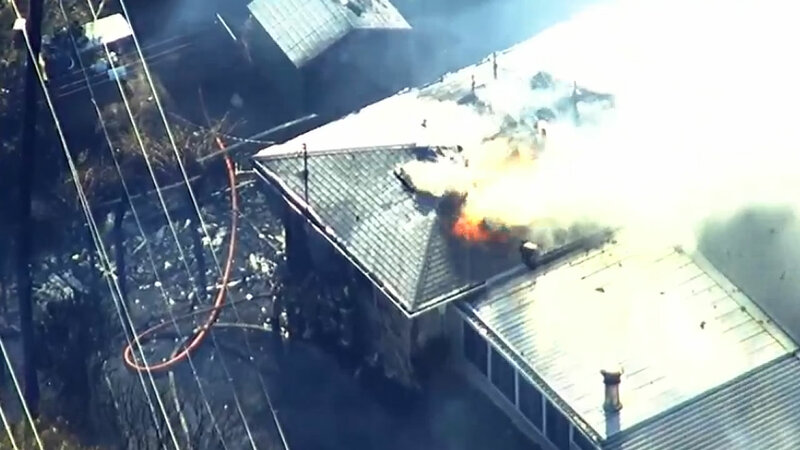 FAIRFIELD, Calif. (KGO) -- Solano County fire crews contained a four-alarm fire that has destroyed one home and damaged an outbuilding Monday afternoon. Power Lines were knocked down in the area, and approximately 4200 PG&E customers are without power. Police reported the fire at about 4:30 p.m. in the vicinity of East Tennessee and Taft streets. Ten homes were evacuated on Taft Street as a result of the fire. The Fairfield Fire Department, Fairfield Police Department, and the Solano County Sheriff's Office responded to the fire. Several road closures were announced, including North Texas Street at Taft, North Texas Street at Empire Street, North Texas Street at East Kentucky Street and Taft Street at East Tennessee Street. Fairfield police say during the evacuations two people were reported missing, but were later accounted for. There were no injuries as a result of the fire. The American Red Cross has responded to assist evacuees.